Have you been wanting to get treatment for any of these skin problems but do not have the time to undergo an intensive medical procedure to receive that “younger-looking skin” you desire? Introducing Microneedling, a minimally invasive yet cost effective process that uses a new innovation in aesthetic medicine for the treatment of a wide range of skin concerns to help rejuvenate and improve its overall appearance. It is a revolutionary treatment that provides the benefits of laser resurfacing with a much shorter downtime required, less pain, reduced redness after the treatment, and a much smaller risk of scarring, infection, and post-inflammation skin darkening. Microneedling therapy, also known as skin needling, Collagen Induction Therapy (CIT), or Percutaneous Collagen Induction (PCI), is the procedure by which the body’s natural response to healing is used to increase the amount of so-called extra-cellular matrix in the skin. During this procedure, tiny needles are used to create controlled micro-injuries to the skin in order to produce collagen and elastin. The skin’s repairing process results in a thicker outer layer with the appearance of softer wrinkles. This increase in collagen production beautifies the skin’s texture, filling in fine lines and well-conditioning the skin giving it a stronger, smoother, and rejuvenated result. The microneedling device also creates superficial micro-channels which allow for topical gels, creams, and serums to be absorbed more effectively into the skin. The micro-channels then created by the needles allow for leakage of blood, serum, and lymph in a controlled and temporary manner. A reduction in the appearance of fine lines and wrinkles, revealing a renewed younger-looking skin with fewer signs of aging. A positive effect on hyper- and hypo-pigmentation, acne scars, traumatic scars, stretch marks, and generally creates a fresher appearance or glow to the skin. Tiny puncture wounds produced by the treatment greatly improve the skin’s ability to absorb topical skincare products, and even help them work better. Stimulation of blood circulation in the treated area by some estimates (over 1000%). Improvement of skin texture and making large pores look much smaller and less apparent. Induction of collagen production of the skin giving it more structure and elasticity. Compared other harsher, more invasive, and more expensive treatments like chemical peels, laser resurfacing, or dermabrasion, microneedling is unbelievably less pricey. What is a typical Microneedling treatment like? Depending on the size of the area treated, a microneedling procedure usually takes fifteen minutes to about half an hour. 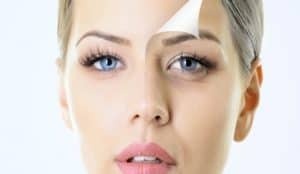 When performed to a patient by a licensed medical professional like Dr. Fadi Nukta here at Nova Plastic Surgery in northern Virginia, which is highly recommended, the process begins with cleaning the treatment area and, when necessary, using a numbing agent if the patient has a low pain tolerance. Next, the doctor will apply a thin layer of a collagen-stimulating product such as hyaluronic acid (a super hydrating serum), vitamin C, and a skin lightener then select the appropriate treatment depth based on your unique needs. Using a microneedling device, the skin is punctured with tiny wounds created in the uppermost surface or the epidermis. The process will be done in a single motion while simultaneously gliding in one direction until the entire area has been covered. An application of a topical skincare solution is normally followed after the procedure to re-hydrate, heal, and protect the skin. Microneedling is not generally painful, although it may involve a little discomfort. Most patients describe the sensation as that of having light sandpaper being moved across the skin. Immediately after the treatment you can expect your skin to be pinkish or notice a bright redness to it, and can last for 24 to 48 hours. You might have, at worst, a mild swelling and few tiny puncture scabs but that will fade over a few days. Pain following the treatment is rare, although can usually be easily controlled with over-the-counter pain medications. It’s important that you keep your skin protected from the sun as you recover. Your skin will continue to experience the after-effects of the treatment for the entire time your skin remodels itself. When will I expect the dramatic results of Microneedling? Right after your treatment your skin should already look and feel tighter and refreshed, despite the initial redness and mild swelling. On average, patients are red for up to 1 to 3 days while some heal completely in as little as 12 hours. A prescribed application of quality skin-healing products will help speed up the process. The total healing time depends on the depth of needles used and the frequency of overlapping passes done by the skincare professional on your skin. Assuming your treatment involved needles of appropriate length, your skin will induce collagen production in about 48 to 72 hours after. Most patients will see improvement in skin texture after only one treatment, while others may require at least 1 to 4 weeks or multiple sessions in order to see optimal results as the treated area grows smoother, tighter, and healthier overall. Visible changes to the skin develop over the course of several days and weeks. Improvement continues up to six months as collagen production increases. Depending on the severity of skin condition, a microneedling session may be received once per year. For most patients, however, it is recommended to have the procedure in a series of 2 to 4 treatments spaced about 4 to 8 weeks apart. For those with deep wrinkles, advanced photo-aging, ugly stretch marks, or heavy acne scarring, it is advisable to have it in 6 to 8 sessions at 4-week intervals. Considering how simple microneedling therapy is, the new collagen produced will actually stay around for a few years, making this treatment a remarkably long lasting, worthy, and value for your money beauty enhancing process. As with any other skin treatment, the inevitable effects of aging and sun exposure will of course gradually set in, and a patient will most likely need to get more treatments as part of a regular skincare regimen. What are the exceptions of having a Microneedling treatment? The experienced healthcare providers at NOVA Plastic Surgery are highly qualified to administer skin needling treatment. To learn more about Microneedling and find out whether you’re a good candidate for the procedure, CALL US NOW at (703)574-2588. How are Laser Peels Different Than Chemical Peels & Microdermabrasion?